Drones have become a popular tool and toy, but also a menace to aviation. Gatwick airport near London was shut down between December 19 and 21 in 2018 when drones were spotted flying near the airport. Hundreds of flights were canceled and passengers were stranded, at great cost to them and airlines. Drones were also spotted near Heathrow airport earlier this month. The irresponsibility of the drone operators behind these incidents is maddening. But what can be done to prevent such incidents in the future? Airports can invest in defense systems including jamming devices, but they have limitations and are costly. New rules are needed to deal with this threat to public safety. Governments are already taking action. The key is to require drone pilots to be properly trained, and for drones to be registered, identifiable in flight, and appropriately insured. Most of the requirements are on drone owners. Drone manufacturers can also contribute technological solutions that increase the safety of their devices. Anyone thinking about flying a drone in the Metro Vancouver area should think carefully about the restricted airspace around them. Vancouver has a major airport and numerous heliports and float plane ports. The image below shows the restricted airspace in red. There are few areas in the Metro Vancouver region where drones can be flown without significant restrictions. I doubt that many owners of recreational drones are aware of the restrictions. The map above was taken from the National Research Council of Canada UAV Site Selection Tool, an interactive map that allows unmanned aerial vehicle (UAV) operators to identify restricted airspace. Transportation Canada is moving in the right direction with new policies that come into effect on June 1, 2019. The new rules require that pilots who fly drones that weigh more than 250 grams must pass a drone pilot online exam (for a $10 fee) and must be at least 14 years of age for the basic type, and 16 years for the advance type. Drones must be registered (for a $5 fee). When flying a drone, it must be in visual line of sight (VLOS) at all times, must remain below 122 meters (400 ft), must remain away from bystanders at least 30 meters, and keep away from airports (5.6 km) and heliports (1.9 km). Drone operators must also respect privacy and stay away from emergency operations and outdoor events. Penalties can be stiff and generally start at $1,000 and go up to $15,000 for putting aircraft and people at risk. The new rules distinguish between basic and advanced operation of drones. The latter is triggered when a drone pilot wants to fly in controlled airspace, fly over bystanders or within 30m of bystanders. In that case, applicants have to pass the advanced exam and, additionally, pass a flight review. These new policies are eminently sensible and Transport Canada is on the right track (or flight path) with them. Ultimately, they may not be sufficient, however, if consumers see drones just as another gadget and remain unaware of the rules and regulations and take their chances. At the point of sale, information on drone use and forthcoming regulations remain absent. extending the requirement of a flight review (i.e., a practical test) from advanced operation to basic operation. requiring public liability insurance for all drones above a certain weight limit or based on specific risk assessment. Drone manufacturers such as DJI are already offering geofencing abilities. DJI's Geospatial Environment Online System provides their users with up-to-date information that helps identify flight restriction zones. Other manufacturers should follow their lead, and ultimately regulation should require it for all drones. 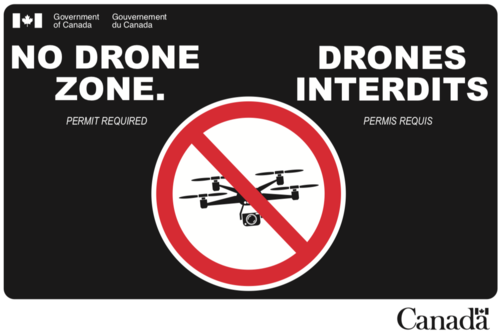 Meanwhile, drone pilots should take note of restricted zones, as signage of the type below will appear in more places. Drones can provide great entertainment and stunning photography and videography. Responsible use of drones is to be welcomed. But as with everything that flies in the air the main principle is: safety first.